Michael Dodman, whichever alias you hear his music under, is a legend amongst his peers and his fans. For the purpose of today it's Hux – the alter ego joining Martinet and Huxley to bring a new kind of sound to the scene. Hux's second release on Do Not Sleep is taking Hux back to old roots. I'm getting back to a much more housey vibe. Not following any trends, just doing what I used to do and enjoy it again. I used Hux as the name as it isn't a million miles away from what I've done before, but with a new twist. Plus I'm lazy and couldn't think of anything else. This alias is aimed a lot more at grooves than simply just club bangers. Do Not Sleep, fronted by Ibiza icon Darius Syrossian, is the label pushing out 'Withouthoover' on Hux's 'Madiloop' EP. 'Withouthoover' is a track that boasts funk influenced rhythms built upon a strong percussion line – with a slick drop thrown in for good measure. As well as another original, title track 'Madiloop' from Hux, there are two remixes carefully crafted by Joeski and Manu Gonzalez. I've been friends with the whole crew for a while, and played for them a few times, so when I made this music it just felt like a natural fit to send it over to Darius, Neil, Matt and the rest of the guys. I think the timing was just right, and i'm sure these two eps are just the start of the relationship. it's been ace to get some great remixers in too! With the influx of music coming not only from Hux but also Do Not Sleep, it's a sure sign that Festivals and the Summer season are just around the corner. It goes without saying that this year one of the biggest parties heading to Ibiza is Do Not Sleep's Cuckoo Land. Every Sunday from May 20th right up until September 24th at the Ibiza Rocks hotel, Hux will be joining visionary resident Darius Syrossian alongside a whole host of other names including Ben Pearce, Detlef, Jamie Roy, Latmun and Theo Kottis. The shows I'm looking forward to the most are the Ibiza shows for the Do Not Sleep and Cuckoo Land guys! I love playing on the Island and can't wait to get back out there, the sound will be whatever I feel suits the vibe! I've got Hux, Huxley and Martinet, and I don't plan on slowing down with any of them. Hux's 'Madiloop' EP is out on 22nd May 2017 on Do Not Sleep. 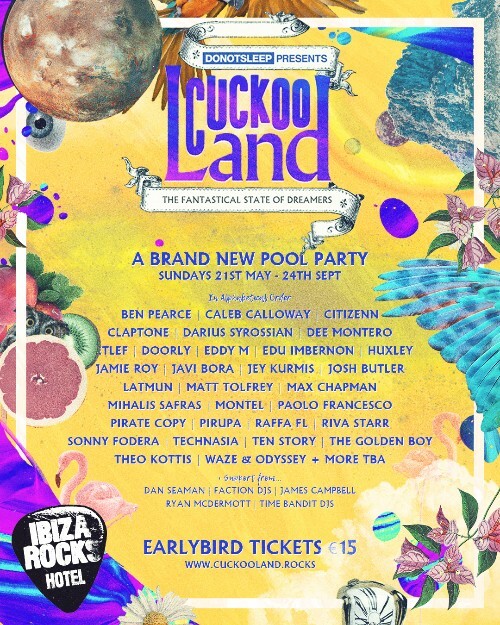 Cuckoo Land will be the start of a new chapter for San Antonio taking place every Sunday at the Ibiza Rocks Hotel. More information and tickets are availableHERE.